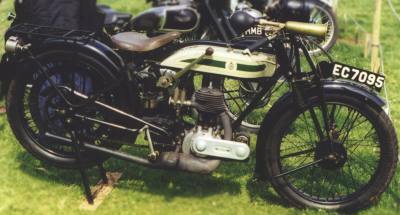 Triumph model P 500cc built in 1925. This had been stored in a museum for 35 years but is now used daily in Carlisle. Like Sunbeam, Triumph started off building bicycles but in 1902 started to build motorcycles and never looked back - building 1000 a week when the model P came along. 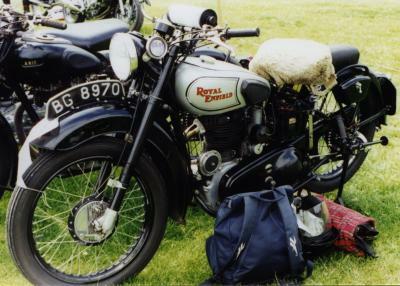 Yet another Victorian bicycle maker turned motorbike manufacturer was Royal Enfield which got its name from the fact that at one stage they provided parts for Enfield rifles for the Royal Small Arms factory and hence the trade mark "Built Like a Gun". They actually built their first motorbike in 1901 and although the British factory closed in 1970 they are still produced in India. This one is a model G built in 1946 with a 350cc engine. It had been stored in boxes for many years before being restored by the owner from Barrow. Philip Conrad Vincent son of a Argentinean cattle rancher was a student at Cambridge in 1927 when he first decided to build bikes.He bought the HRD name off Howard R Davies a former TT winner to gain prestige but it was the innovative designs he produced that made the bike a classic marque. 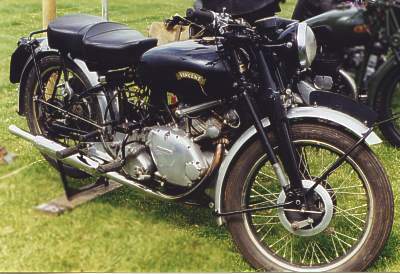 The Vincent name is famous for its fast V-twins like the Black Shadow. It was great to see this specimen at the vintage rally but unfortunately it didn't appear in the catalogue. My guess is that it could be a 1950's 500cc Comet because it doesn't appear to have a V-twin, yet it does have many similarities to the Black shadow and in 1950 HRD was dropped from the name. Please let me know if you have further details. Vincents went on to break many speed records including over 150mph by a Black Lightning at Bonneville in 1949. 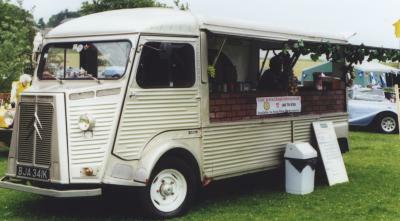 Not a bike - I know - but I didn't have a section for restored Citroen H vans that have been converted into mobile pizzeria. This is a 1972 model that had been lying derelict in a field until it was rescued and restored by John Raffo. With the addition of a traditional wood burning pizza oven it has made an attractive vehicle for catering at outdoor events. Best of all it has its own web site - So if you want to read the menu or find out more about the H-van follow the link below.